Welcome to Dive Kapiti, your friendly, knowledgeable, one stop underwater shop on the Kapiti Coast! Our aim is to promote the safe enjoyment of the sea in and around the beautiful Kapiti Island Marine Reserve. From the novice to the pro, whether you are into spearfishing or SCUBA, snorkeling or swimming, there’s something for everyone. Come on down and see us at our awesome retail showroom at 27 Milne Drive, Paraparaumu (Western side of the Expressway. Left at the lights). Craig took over Dive Kapiti from its previous owner in 2014. Craig’s love of diving is infectious, and if you are lucky enough to go out on a dive with Craig, you can be assured you will hooked too! 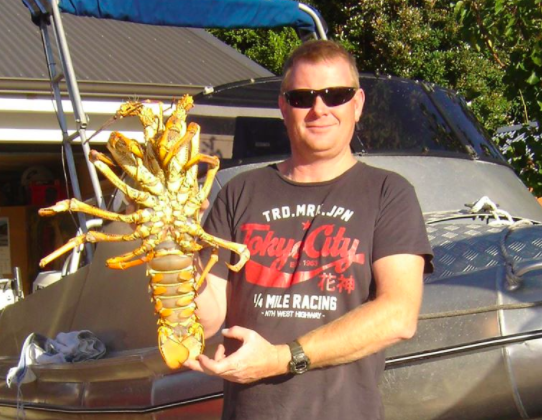 In fact Craig only started diving in 2013, and pictured above is his first Crayfish catch – a whopping 3.5kgs! Just to prove what is achievable for the new enthusiast.